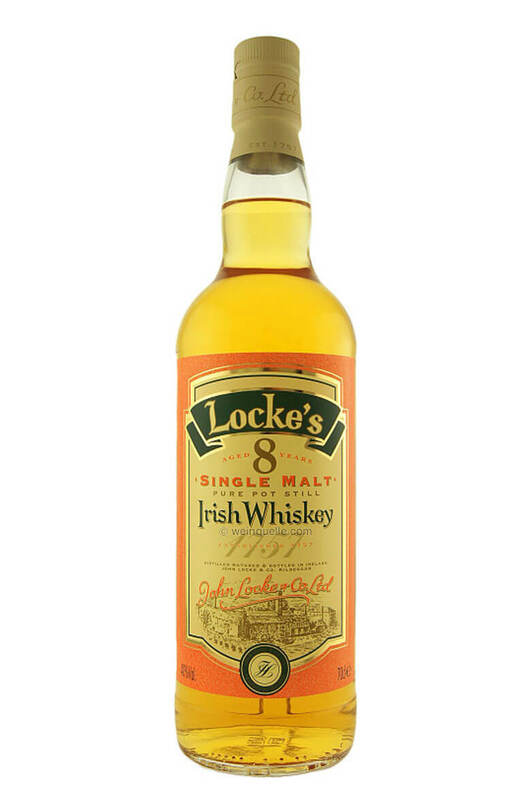 Lockes 8 year old single malt was first released in 2000 and is double distilled in traditional pot stills. 10% of the malt is peated. Using whiskies aged between 8-10 years, it is medium bodied with plenty of fruit and spicy oak. This won Gold Medal and Best in Class in the 2009 International Wine and Spirits Awards. Nose Pencil shavings, toasty oak, vanilla, citrus fruits and orange zest. Palate Soft and woody with a crisp, oaky character. Quite chewy and mouth filling with flavours of citrus peel, vanilla, toasty oak and caramel. Types of Barrel used for Aging Mostly new ex-bourbon barrels, with some second and third fill used. Style Double distilled single malt, mostly unpeated. This is an early edition of Locke's 8 Year Old single malt. The 8 Years Old print appears to hav..